With a gritty reputation that was arguably equaled only by Guns N’ Roses, Mötley Crüe’s infamous antics made them a force to be reckoned with in the ’80s. As one of the first and most influential hair metal bands of the ’80s, Mötley Crüe had a series of hit albums, the biggest and most noteworthy being 1989′s Dr. Feelgood. The band continued to court controversy into the next decade, even when their recording career took a downturn through a series of well-publicized mishaps and run-ins with the law. Mötley Crüe’s beginning can be traced back to 1981, when bassist Nikki Sixx (born Frank Ferrana) and drummer “Tommy Lee” Bass decided to leave the bands they were in at the time and pursue a new project together. Bob “Mick Mars” Deal was hired to play guitar and “Vince Neil” Wharton was added as vocalist. The band went through several name changes before Mars presented them with Mottley Krue, recalling a time when his previous band was described as a “motley looking crew.” After agreeing on this name and altering the spelling somewhat, the newly formed group began to play at local clubs and soon became cult favorites, known for their unique stage theatrics. After a short hiatus, the band regrouped with Neil to film a music video for “Home Sweet Home”; the first hit power ballad to be aired on MTV, it became their most requested music video for four months straight. A 44-minute home video cassette, Uncensored, was released in 1986, containing rare live footage and interviews; meanwhile, Lee married actress Heather Locklear. A year later, Motley Crue released their fourth album, Girls Girls Girls. The uncensored video for the popular title track was immediately banned from television, not airing until a slightly cleaned-up version was released. The group finally embarked on their own tour, but the European dates were canceled when Sixx suffered a drug overdose and nearly lost his life. Over the next year, all four members sought out drug rehabilitation and Motley Crue remained out of the spotlight. They returned, clean and sober, in 1989 with Dr. Feelgood, which hit number one on the Billboard charts due to the strong singles “Kickstart My Heart,” “Don’t Go Away Mad (Just Go Away),” “Without You,” and the infamous title-track, which became their first Top Ten single. After another worldwide tour, they released a compilation album, Decade of Decadence, in 1991. The album opened at number two, and a home video of the same name was released shortly afterwards. The group created their own record label, Motley Records, and signed a new contract with Elektra for $25 million. Unfortunately by this time, the music industry that made them famous was beginning to change, and the pressure to keep pace with the times began to take its toll on the bandmembers’ camaraderie. In 1992, sessions for Motley Crue’s next album turned ugly, and Neil was fired and replaced with vocalist John Corabi, formerly of the Scream. The 1994 product was Motley Crue, which peaked at number seven in the U.S. and eventually went gold, but was ultimately a commercial disappointment (as was a supporting tour). In early 1997, Corabi was fired and Neil rehired for the much-hyped Generation Swine. (Corabi resurfaced alongside former Kiss guitarist Bruce Kulick in the group Union.) Though Generation Swine opened at number four, it was sharply criticized and fell off the charts before long. In 1998, the band released Greatest Hits, but shortly after the supporting tour, Lee was arrested for spousal abuse against wife Pamela Anderson and sentenced to jail time for most of the year. Meanwhile, the group’s deal with Elektra fell apart, and Motley Records switched its affiliation to the Beyond label, with the band acquiring the rights to its back catalog. After numerous bitter encounters with Neil, Tommy Lee left the band in 1999 to form Methods of Mayhem, who released their self-titled debut late that year; he was replaced with Ozzy Osbourne drummer Randy Castillo. 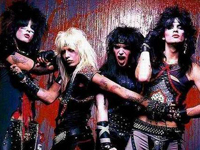 That year, the revamped Crue issued remastered editions of all their studio albums (complete with bonus tracks) plus the rarities collection Supersonic and Demonic Relics. An album of all new material, New Tattoo, appeared in the summer of 2000. Also in 2000, Sixx found time to launch a side project, 58. On the eve of the Crue’s tour in support of New Tattoo, Castillo was stricken with an undisclosed illness and sat out the tour to recuperate. Instead of canceling the tour, the Crue temporarily enlisted Hole drummer (and lifelong Crue fan) Samantha Maloney.